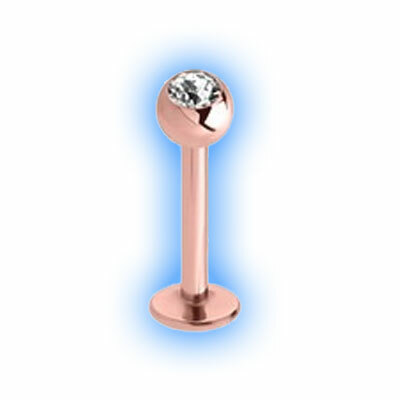 These Jewelled Rose Gold Plated Labret Studs are plated and individually hand finished by us in the UK, you will not find these anywhere else with such a large choice of different lengths and ball sizes. They are 1.2mm (16 gauge) in thickness and available in different lengths (6mm, 7mm, 8mm, 9mm, 10mm, 12mm or 14mm) - the length measurement is taken internally in between the base of the labret and the ball (so it is basically the past that goes through your piercing). The ball is set with a Swarowski Crystal in the colour of your choice and they are available with either 3mm (which is the standard size) or 4mm balls. They look stunning in Monroe piercings, facial piercings and also ear piercings. Labret studs are particularly comfortable to wear in ear piercings including tragus and helix because they are inserted from the back of the piercing - the disc is fixed to the bar and only the front ball has to be screwed on so they are easy to fit and also the flat studs at the back are very comfortable to wear. These labrets are externally threaded, meaning the thread is on the stud and the ball has a hole to accommodate this, they are compatible with the 1.2mm threaded attachments that we sell.